Amavasai/No moon day is considered to be the most auspicious day to perform rituals to our ancestors. On the day of Amavasai, we should take head bath (not oil bath) early in the morning. 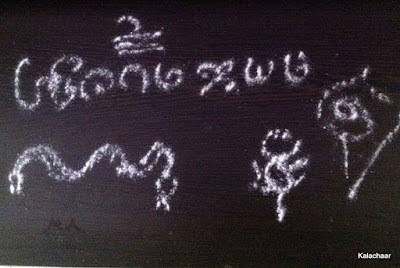 Kolam is not drawn on the entrance until the ritual of offering Tharpanam is completed. Children/elders who have parents should not take head bath. None of the gents are allowed to shave beard. We should not cut nails/hair on that day. This time Amavasai happening on Monday during the Tamil month of “Thai” adds more value to the auspiciousness. This day occurring tomorrow happens once in 32 years called as Mahodhaya Amavasai. My neighbor who is a senior Pandit explained me the significance of the day. Tomorrow (8-Feb-2016) is a Monday (Somavaram) combined with Thiruvonam Nakshatram and Vyathipaadham. People who have to perform Tharpanam used to go to river bank to perform this ritual. Tomorrow, by early morning during sunrise Tharpanam has to be performed once. After that once again usual Tharpanam is also performed. Gents who have to perform Tharpanam should complete the ritual first preferably with the guidance of their Guru (Pandit of their family). This is to ensure that we offer at least a small value of fund to our Guru. After performing the Tharpanam, gents have to perform their regular Pooja whatever they usually do at home and Sandhiya vandanam. Female members will lit the lamp and draw Kolam as soon as the ritual is completed. Male members who have lost their father become eligible for doing Tharpanam. His spouse also has to undergo fasting on this day. Usually, as part of fasting, people skip breakfast. They consume lunch directly that is prepared without onion and garlic. Dinner was also skipped by most of the people. However, nowadays due to the work culture and health issues, we consume some simple food like idly, Oats Poridge, Upma or Dosa. The dinner is also prepared without onion and garlic. In my grand fathers home, they prepare Paysam, Vadai, Thayir Pachadi, sambar, Rasam, Plaintain curry, (is a must on the day of Amavasai) and koottu. This heavy lunch fill their tummy thus enable them avoid the dinner. Tomorrow being Thai Amavasai, Paruppu Payasam is prepared on the day and offered to god. Raw rice with black ellu (Ajwain seeds) is offered to the crow before we consume food. Refer my Pongal Festival Post for the list of vegetables that should not be used on this day. Children are not allowed to undergo fasting on this day. Especially, those who have parents must ensure to have a small portion of Rice for dinner. My perimma is here with me for few days. I heard that her grandma taught her a kolam that is drawn on the Pooja room on the no moon day. This Includes the pictorial representation of a Snake, Crab and a Sangu and they offer milk to god on the day. By offering the snake crab and milk, the belief is that their family members do not get to see the reptiles that ensure their safety. My perimma was working in a small village where there is frequent roaming of Snakes. But by following the above ritual, she had never seen a snake nor disturbed. However, her companions at work while walking to work or coming back frequently get to see the reptiles. On this Thai Amavasai that occurs on Monday, it is believed that offering to needy people, brings in loads of goodness to our family. I was also advised to go to the nearest temple and round the Arasamaram ( Peepal tree) early in the morning. Reading all your post. Good Job. I have grown up seeing all these things happening at home. But I always think there is some scientific reason behind these rituals and customs. Good Work and keep it up. Hi Bhavani, Thanks. You are right. There are lot of reasons behind doing these rituals. Aadi Amavasai Tharpanam will bring you the blessings of your ancestors on Aadi Amavasai day. Attain transquility and prosperity by performing Amavasai day. Participate in Aadi Amavasai Tharpanam and receive blessings from grand parents.